My mother was Croatian, my father was Slovak. As a result, I was immersed in two different Eastern European cultures, each with their own set of traditions. It seems that these traditions came to the forefront during the holiday season. As a Slovak, I was fortunate to be able experience one of the most beloved Christmas traditions, the Vilija (pronounced vă – lē´ -yă.) Vilija is the traditional Christmas eve gathering and dinner that is rich with traditional foods, religious symbolism and family. The vilija continues to this day in my family, and although the venue may have changed, the traditions and symbolism remains intact. What an incredible testimony and homage to the parents, grandparents and hunky culture that helped to set our moral compass. A bit further in this post, I have included a 2005 article from the Pittsburgh Tribune-Review by Karin Welzel. The author does an outstanding job of explaining the tradition, the content and the meaning behind the celebration. As a first generation Slovak Family, we followed these traditions to an extent, but through the years, they were adapted to a degree. Rather than be redundant, allow me to give you my impressions and memories of the event as I experienced it in the 50’s. The vilija always took place at my Uncle Gary and Aunt Helen’s home in West Mifflin. Just like a scene from “A Big Fat Greek Wedding,” I remember entering their house and immediately getting drawn into the crowd of family that were already preparing the feast. Their home was always decked out with Christmas decorations galore and every light in the house seemed to be burning. Usually, by Christmas Eve in Western Pennsylvania, the weather had usually taken a definite turn and it was normally either snowing or on the verge of doing so. For that reason, whenever I entered their home, it felt so toasty warm compared to the outdoors. Their windows were usually steamed up from all of the cooking that was occurring and from the cranked-up thermostat (Grandma was always cold you know). And then there were the smells! The freshly cut Christmas tree scent hit me as soon as I entered the house. (It must have been the magic aspirins!) Combined with the smell of fresh pine was the amazing aroma emanating from the kitchen and dining room. All of my aunts were buzzing around a rather cramped kitchen preparing all of the traditional foods. Somehow, all of the foods which were part of our everyday lives growing up as a hunky smelled so much better on Christmas Eve! Stuffed cabbages, pirogies, kielbasa and poppy seed rolls smelled like food for the gods! I was a very picky eater in those days, but somehow, I became a modern-day foodie during the vilija. My uncles had the responsibility of creating a dining surface large enough to accommodate our ever-growing family. Since my dad was one of 8 children, the number of people attending was quite large. 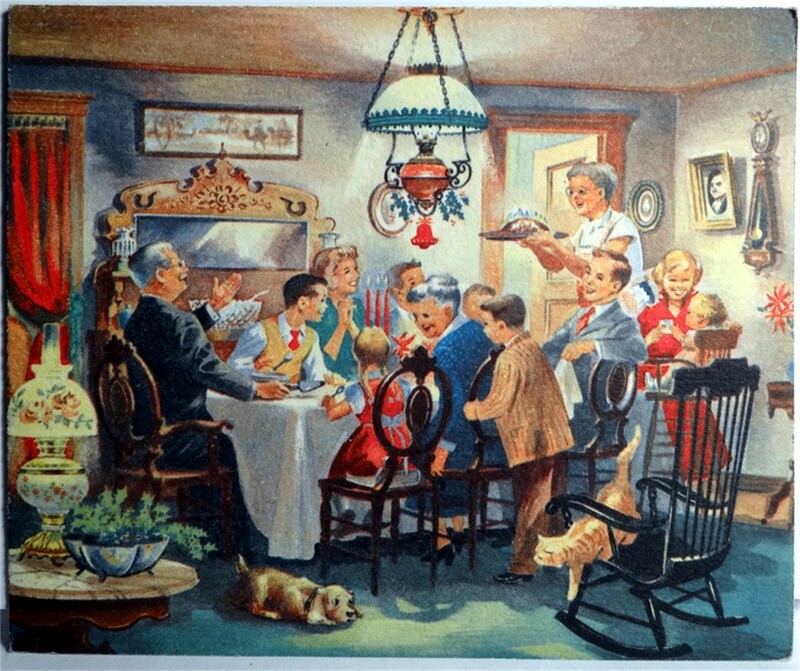 There was no such thing as a “kids table” in those days, so the eating surface had to accommodate approximately 25 people PLUS the feast itself. The table was usually assembled using two tables which supported large sheets of plywood. It was at least 16 feet long, extended from the dining room into the living room and was always covered with crisp white linens. There were never any decorations on the table, only food, lots and lots of food! The chairs that surrounded the table were a potpourri of chairs from around the house, the out-of-town neighbors and often times from St. Michael’s Church hall. Your seat may not have matched with the neighboring chair, but every family member had their place. The timing of the dinner was very strategic. It was essential that we ate and were finished with dinner by 6 p.m. In those days, it was important that we allowed for the correct about of time before receiving communion at midnight mass. The Roman Catholic Church has very specific rules governing communion. Grandpa would always begin the vilija with a blessing. This would be followed by the passing of oplatky (unleavened bread that had been blessed by the parish priest). We would pass a large square piece of oplatky and each person would break a small piece off to be consumed in unison at the end of Grandpa’s blessing. I remember that the oplatky would always come to the table in an envelope that was decorated with a colorful representation of the birth of Christ. Once we had taken our oplatky, the feast began. With amazing speed and dexterity, plates and bowls of food were passed around the table and plates were loaded up to the max. Jokes, teasing, memories, and plans for the holidays were just some of the discussions that occurred during the meal. My dad would always be yelled at by my mom and my Aunt Helen for something he might have said to instigate some trouble, but that was expected, and welcome. After the main courses were completed, out came platters and platters of goodies. Poppyseed, apricots and walnuts seemed to be part of every creation. Each would probably be capable of clogging any artery in the room, but somehow, it either didn’t happen or didn’t matter in those days. Our naivety was bliss in those days. Once the dinner was over, my aunts would begin clean-up. Sexist or not, that was the way it was in those days. The men would gather and have some celebratory “shots” and beers, the kids would share their wish lists with each other and the ladies would clean-up the remnants of the feast. There seemed to be an unspoken exception to the communion rule in our family that shots and beers didn’t count when it came to abstaining before communion. Go figure. After everything was in order, each family departed to get ready for midnight mass at their own parish church. Fully stuffed and raring to go, the remainder of the Christmas Eve activities still lay ahead. 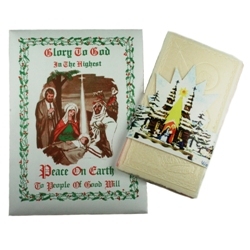 Each individual family unit would attend Midnight Mass at their own parish. The majority of my Slovak aunt and uncles on my dad’s side attended St. Michael’s Parish in Munhall/Homestead. My Uncle Hank’s family were members of St. Theresa’s in Munhall and we were members of Holy Name Church in Duquesne. I remember the sensory overload that hit me every year at midnight mass at Holy Name. After entering the church from the cold, dark night, the church looked brighter and more radiant that at any other time. The was a distinct fragrance that filled the air. It was a combination of the radiators going full tilt to warm the church, the smell of beeswax candles burning brightly, the aroma of pine and poinsettia, and the subtle whiffs of cologne that you could detect from the ladies in congregation. Before becoming an altar boy, my perspective was always the same sitting with my family. We always sat on the extreme right hand side of the church, approximately three-quarters of the way from the front of the church. If nothing else, we were consistent. The location was a bit awkward for me however. It was great for hearing the choir perfectly, but it made it impossible to be able to turn around and gawk at them. Halfway through the Mass, I was usually fidgety and VERY anxious to get on with the evening. Although it seemed like hours, we were finally able to head on out to enjoy the rest of our Christmas Eve traditions. Prior to the death of my mom when I was 12, our Christmas eve ended shortly after we returned home after Mass. Mom would allow my brother and I to have a few cookies and a glass of milk before we went to bed, and then set out a plate for Santa. We were ALWAYS very cooperative on Christmas Eve and went straight to bed. Steve and I would usually discuss what would be happening that evening while we tried to quash our excitement enough to sleep. In truth, the fact that it was already into the wee hours of the morning, it didn’t take long for us to conk out. After my mother had passed away, we changed our Christmas Eve tradition. Instead of returning home, Dad, Steve and I would traipse on up to 3334 Duquesne Ave, Grandpa’s house, and join all of my grandparents, aunts, uncles, and cousins for a continuation of the Christmas celebration. Aside from the re-emergence of all of the food from earlier in the evening, shots and beer as well as whiskey sours would become the “beverages of choice” for the evening. The following were part of the traditional dinner served on Christmas Eve. Boil potatoes until soft in approximately 4 quarts of water, reserving the water for later use. Slice the mushrooms. If using fresh mushrooms, precook in water for 15 minutes on a low boil, discarding water. Divide the potatoes into two different pots. Place the mushrooms in one of the pots with the potatoes. Place the peas in the other pot of potatoes. In a frying pan, create a zaprazka (roux) with flour and butter. Begin by melting the butter and sautéing the onion in the butter. Season with salt and pepper. Slowly add the flour to create the zaprazke (roux) that is medium brown in color. Slowly add reserved water from potatoes to the zaprazka over a low heat, stirring constantly. Heat until thickened. Divide into two equal parts, adding one to the mushroom and potato mixture and one to the peas and potato mixture. Additional water can be added, if needed. Add approximately 2 tablespoons (or to taste) of vinegar to the mushroom soup. This recipe is one that we have been using for years and it has never failed! Mix flour with butter or margarine, as for pie dough. Beat eggs lightly. Add to flour mixture. Add baking powder and sour cream. Mix all together and refrigerate overnight. Roll the dough in sugar and flour. 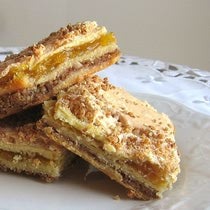 Cut in 4 inch squares and fill with apricot or other filling. After filling, bring one corner over the other at opposite ends. Bake at 375 degrees for 15 to 20 minutes. Approximately 120 horns. Combine yeast with warm water and set aside. Sift flour in a bowl and blend with Oleo until mealy. Add slightly beaten egg yolks, milk and yeast. Blend and stir mixture until it pulls away from the bowl. Place on a floured board and knead for a few minutes. Divide and cut dough into 3 sections. Let rise for 30 minutes. Roll the first section and place on a slightly greased 15 x 10 inch cookie sheet. Work the edges of the dough up along the edge. Combine walnuts, sugar and cinnamon together and mix well. Set t cup of nut mixture aside for the topping. Spread the remaining nut mixture on top of the dough in the cookie sheet. Roll the second section of dough and place on top of the nuts. 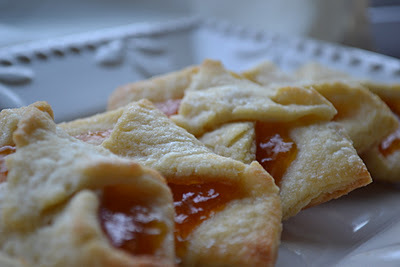 Spread apricot filling evenly over dough. Roll third section and place over apricots. Bake at 350 degrees for 45 minutes. Ten minutes before baking time is over, beat the egg whites until stiff. Add the sugar to the egg whites. Remove torte from the oven and spread egg white mixture over the top. 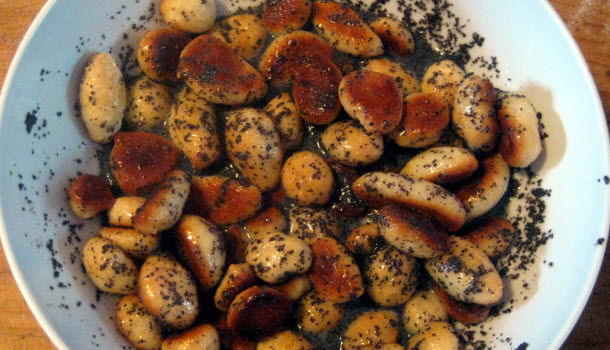 Sprinkle with remaining nuts and place in the oven to brown (for about 10 minutes). Cut into diamond-shaped pieces while still hot. Aunt Helen made this torte for all holidays, weddings and special celebrations. These bite-sized dumplings can be made from frozen and thawed sweet bread dough to save time. Form portions of the dough into 1-inch rolls, then cut small pieces and bake. Dissolve the yeast in the lukewarm water. Add the salt and 1 tablespoon sugar. Let set to proof, for about 10 minutes. Sift together the flour and remaining 1 tablespoon sugar. Add the yeast mixture, 1/4 cup oil and enough of the 2 cups tap water to make a workable dough. Knead well. Let the dough rise until doubled. Meanwhile, grease a cookie sheet with oil. Punch down the dough. Cut off portions of the dough about the size of an egg. Roll each out on a floured board by hand to make rolls about 1 inch in diameter. Cut into 1-inch pieces. Place the pieces on the prepared cookie sheet and let rise for about 20 minutes. Bake the dumplings for about 10 minutes, or until lightly browned. Let cool, then separate. Place in a colander and pour boiling water over them. Drain quickly to prevent sogginess. Sauerkraut: Saute 1 small onion, chopped, in 2 tablespoons vegetable oil. Add 1 pound drained sauerkraut. Cook for about 15 minutes. Add to half of the bobalky. Poppy seeds: Combine 1 cup ground poppy seeds, 2 tablespoons honey and 1/4 cup water. Add to the remaining bobalky. From the straw scattered under the dining table to the honey that is spread onto thin oplatky to share among diners, the Slovak Christmas Eve meal — called the Vilija table — abounds with religious symbolism. Christmas Eve is the most awaited day of the Christmas holiday season, according to Albina and Joseph Senko of Mt. Lebanon, members of Western Pennsylvania’s Slovak community. “The big day is Christmas Eve rather than Christmas Day,” says Albina Senko, a native of Spis in Slovakia. She is a director of the Western Pennsylvania Slovak Cultural Association, founded by her husband in 1997. A certified public accountant with McKeever Varga & Senko and a certified financial planner, Joseph Senko also is honorary consul to the Slovak Republic. The Senkos continue to observe the customs and traditions of their ancestry — Joseph Senko was born in Pittsburgh to Slovakian immigrants — and have made it a personal mission to educate Slovak-Americans and the general public about their culture. They are Roman Catholic, as are most of the inhabitants, but they say Byzantine and Orthodox Rite worshipers might follow similar traditions. Slovakia features a wide variety of dialects and customs, varying from region to region, village to village, family to family. Albina Senko has her home decorated Slovak-style, including a table-size tree festooned with edible ornaments, such as whole walnuts and wrapped candy. There are intricate ornaments made from straw. On larger trees many years ago, family members used apples, paper roses and candles for decorations, too. The top of the tree often was a star made from straw. Slovak cooks are busy on Christmas Eve, Albina Senko says. Sauerkraut-mushroom or pea soup, bobalky (sweet dough dumplings) and a variety of fish are a must, as well as meatless pirohy, to maintain the fast observed by the faithful during Advent, which begins the fourth Sunday before Christmas. In anticipation of the celebration, hay or straw is placed under the tablecloth or under the table — or both places — to symbolize the poverty of Christ in a humble manger. Some families place straw in the center of the Advent candle wreath, Albina Senko says, and a figure of the baby Jesus is placed on top. The table is covered with a white cloth as a symbol of the swaddling clothes of the Christ child. Another tradition is to set an extra place setting to receive a stranger or in honor of a deceased loved one. The dinner starts at the sighting of the first star of the evening. “You tell the youngest child to look for it — it may be that it’s just to keep them occupied, because there is a lot of expectation,” says Albina, adding that there is just as much merriment at her house for Christmas Eve now as when her six children were small. She has grandchildren who are excited about the lights, the dinner and gifts. After the house and table are blessed using a pine bough and holy water, a mulled red wine steeped with cinnamon sticks or herbs and honey is served to diners. 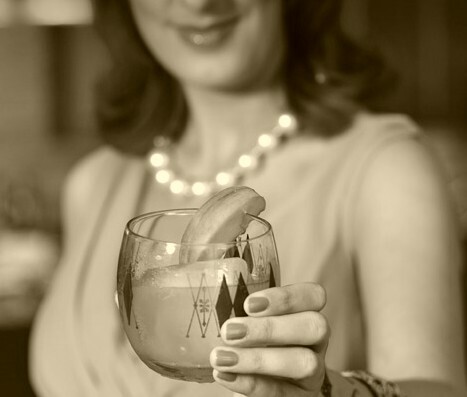 Albina Senko sweetens her wine with cranberry juice, cinnamon-sugar and a dash of nutmeg. The ceremony then focuses on a waferlike “bread” called oplatky (altar bread) that is broken, dipped in honey and distributed to each family member, starting with the husband to his wife. The head of the household dips his thumb in honey and makes the sign of the cross on the foreheads of each member of the household so they will be reminded to keep Christ foremost in their thoughts and praying that harmony will sweeten their lives. Part of this ceremony focuses on daughters who are eligible for marriage. The next course usually is a tart soup — sauerkraut and mushroom is a popular choice — to represent the bitter destiny of Christ and his suffering for humanity. The family then loads up their plates with bobalky, sweet dough balls baked and mixed with sauerkraut or poppy seeds, symbolic of a plentiful crop. Joseph Senko likes a topping of cottage cheese on them, too. Platters display a variety of fish that has been floured and quickly sauteed in oil. Because Slovakia is land-locked, carp and trout are common, but Albina Senko likes white fish such as tilapia to grace her table. Also served are pirohy stuffed with fillings ranging from sauerkraut to cheese and potato; and English peas, which represent a bountiful growing season. Albina Senko folds peas into a mayonnaise-rich potato salad; other families fold peas into hot mashed potatoes. Holubky are cabbage rolls stuffed with ground mushrooms and rice. The Vilija ends on a sweet note, with nut and poppy seed rolls. Walnuts in the shell and apples also are placed on the table. None of the foods contain meat, still keeping with the Advent fast. 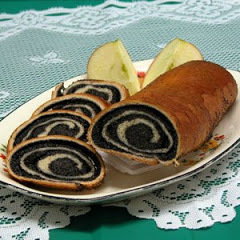 To wrap up the meal sweetly, Slovaks traditionally serve kolaci, pastry rolls made with sweet dough filled with poppy seeds, dried fruit or nuts. In recognition of the empty seat at the table, none of the food is removed from the table after the diners are finished. “It’s for the people who couldn’t be there,” Albina Senko says. Before midnight in Slovakia, the animals in the barns are given remnants of the meal — the food from the table is supposed to make them healthy and productive for the coming year. The Senkos host tours regularly to Slovakia to acquaint Americans with their culture. Albina Senko is a retired travel tour operator, as well as a frequent translator for Slovakian visitors and officials who visit Pittsburgh. It is their wish to improve the lives of their countrymen across the sea and bring Slovakian culture into the homes of the general public. This entry was posted in Christmas Memories, Hunky Celebrations, Wintertime. Bookmark the permalink. My Slovak “baba” and Ukrainian mother have long ago passed away, and my brother and I wish to find out about a vague memory about some scary “pranksters” that would visit homes during the holidays. My brother remembers something about a scarecrow. Does anyone recall this tradition? My family was also Slovak they were Byzantine. I loved the food. my favorite was the kraut and mushroom soup. The potatoes with the butter and onions with I think parsley. both bobolky’s. In later years a few other things were added but still meatless. Breaded shrimp my Auntie Ann’s own recipe) and no one makes it as good as she did, refried beans. Now we only have only Auntie Mary left all the other Aunts and Uncles are gone. No one got together last Christmas and it did not feel like Christmas. I plan to get the family recipes. I want my Grandchildren to know the traditional meal. Hello: Where IS Karin Welzel? I’m a former co-worker and troublemaker from The Dispatch. Wow…..Fabulous memories. Our family was just like yours. You have done such a wonderful job Jim. My best friend and I graduated from West Mifflin North, however most of our friends were from Duquesne. I attended Holy Trinity School and then my mom remarried and I went to St. Josephs 4th through 8th. My maiden name is Connie Mikulas and my best friend was and still is T.J. Olinski. I am slovak and the traditions we had were wonderful. Thanks again. There are a lot of great recipes and menus for the Christmas Eve dinner (as well as Easter traditions) in the Anniversary Slovak-American Cookbook that was published by the First Catholic Slovak Ladies Union. I cherish the copy my grandmother, Margaret Kuzma, gave me in 1957! How I miss those dinners and the family!! GOD BLESS YOU JIM, FOR MAINTAINING THIS WEBSITE. Wow! Thank you for all the recipes! It is my turn to have Christmas this year and am certainly going to try some of these that I grew up liking from the Hungarian side of my family (father). It brought back so many memories, and, had to chuckle a little when I read of all the “Helens and Steves” in so many families. I had grandma Helen and Aunt Helen and then of course my father, Stephen, named after his father, Stephen, Sr.
Really enjoyed sharing your memories as well as my own. I grew up in West Mifflin went to St Michaels Church. Gary Volk was one of my classmates for eight years there. My name before I got married was Pcola. Wow! Thanks for the recipes and memories. Merry Christmas & Happy New Year to you & your family…. I wondered about the Christmas eve meal also. I remember we weren’t allowed to eat meat until after we got home from midnight mass. No matter how tired I was, I wanted that kolbassi I had been smelling all day! We had bean soup, sautéed mushrooms, and the bobalky. I wasn’t thrilled about anything on that menu. And we also had the oplatky with honey and the garlic beside it. Thanks to Jim for sparking those memories for me. Does anyone have a recipe for nut roll? My father worked with a nice man whose last name was Pomnian, from Duquesne. I’m not sure what country his family was from. Every Christmas, his mother made this fabulous nut roll and gave us one. It was a sweet yeast raised dough with chopped walnuts inside. It’s been 45 years and I still remember how delicious it was. Their family are all gone now, but I would bake it and keep their tradition alive, if only I had a clue to the recipe. Mix flour, salt and sugar. Add margarine and mix as for piecrust. Set aside. Heat milk; and put yeast into part of milk. Add eggs into the remaining milk. Add this all to the yeast mixture. Add the wet mixture to the dry mixture to form a soft, but not sticky, dough. Divide the dough into 6 parts and roll and fill with the filling. Let rise for 1 ½ hours. Bake at 350 degrees for 35 to 40 minutes. Mix nuts, butter, honey and sugar. Beat egg white until fluffy and add to nut mixture. Heat milk until lukewarm and add to mixture, using your own judgment to spread consistently. Mix flour, butter, sugar and salt as for pie dough. Mix eggs, vanilla, sour cream and crumbled yeast in a separate bowl. Mix flour mixture and egg mixture together and knead in bowl – very well. Put dough on dough board and make an even roll. Cut into 6 pieces. Roll on flour and sugar mixed together. Make 6 balls and let rise for 1 hour. Then roll dough and fill with filling. Raise on a greased baking pan for 1 hour – 3 large rolls to a pan. Bake at 350 degrees for 30 minutes. Mix sugar and nuts together. Measure 2 cups of mixture for 1 roll. Place poppy seeds in water for 10 minutes. Boil milk and add sugar or honey to taste. Pour over poppy seeds and cook until thickened. Jim, thanks for the recipe. Will try it this weekend! Wow ! You did bring back so many wonderful memories. Instead of passing around the oplatky we each got a whole one and then we ourselves dipped it in the honey and yes there was double dipping going on. I still get my oplatky from the same place and it has the same picture on the envelope, you can get all white, white with the one pink one ( that is the one always got ) just because I was the only girl. It seems moms did not count in this. Then they came up with all different colors. Ours was a meatless meal with the mushroom/sauerkraut soup, next bobalky three ways, rice and navy beans, oh we also had bread made the same time as the bobakly and the bread had lekvar all over the top of it. Oh and to start the meal usually my dad had some garlic to eat for good luck. Needless to say no one wanted to sit next to dad in church for the midnight mass. We did not have fish or anything else and of course the meal ended with the nut rolls and oh so many cold dough cakes. Oh we also got to open one gift ( my mom’s choice for all of us ) it was usually a coloring book or a book—–I think that was so we would be kept busy until everything was cleaned up and time to leave for church which was about two hours before midnight, just to get a seat. Good, old, beautiful Holy Trinity Church, aaaahhhh those were the days, my dad and husband went to St Michael’s in Munhall and talk about beautiful and Fr. Altany ( I think that is how is name is spelled ). Jim reading your articles on Duquesne, on traditions, on so many other topics has been so very uplifting. You are so special for doing this and putting it out for all to read and remember. I know most of us think about the good times the days gone by BUT somehow when you put your “pen to paper ” ( so to speak ) it all feels like it was yesterday once more. From the bottom of my heart thank you so very much. Vesele Vianoce and Stastny Novy Rok !!!!!!!! Thank you Claudia! Your kind thoughts and warm recollections are very much appreciated. 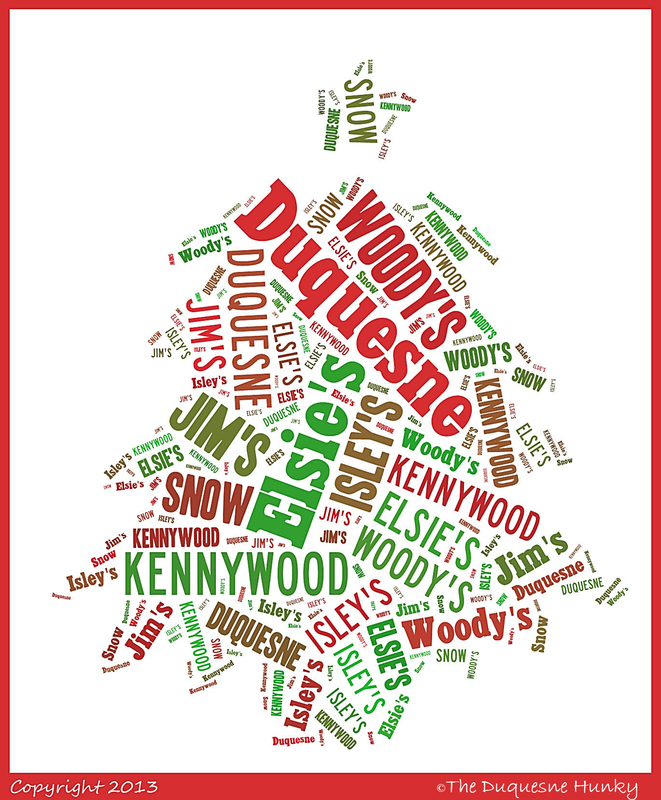 A very, very, Merry Christmas to you are your entire family and to all our Duquesne friends. Thanks for all the great memories, Jim! I will never forget meeting your wonderful Slovak/Croatian family for the first Viljella. Merry Christmas and blessings to you, your growing family & all your blog followers! Thank you so much for sharing such wonderful traditions and family recipes with your readers. You described it all so well that it was easy to imagine we were all there with you amid your relatives. I grew up in another area of Pittsburgh, but your writing made me nostalgic for traveling to see aunts and uncles down brick roadways sliced with streetcar tracks, close to St. James Catholic Church in Wilkinsburg. Merry Christmas- and as always, I enjoy your blog! Thanks for the memories. Our oplatky always had honey and walnuts on it. A very Merry Christmas to you and your family, as well. Really love reading your stories! Jim, thank you for this Christmas Eve memory. Ours was similar to yours being of Slovak descent. Even now, my wife continues her family tradition, a polish Viljella that doesn’t include any meat but 8 different foods including fish, potato soup, pierogis etc. Merry Christmas to you and your family and a Happy and prosperous New Year. You mentioned the smell of stuffed cabbages and kolbasa — did yinz eat meat on Christmas Eve?!? My family did (and still does!) a combination Polish/Slovak Christmas eve (meatless) dinner: mushroom/sauerkraut soup, pirohy (cabbage or potato), bobalky (two ways — with sauerkraut or with poppy seed and honey), fish, herring (sledzie! — both in a cream sauce and in a wine sauce), shrimp, stewed fruit… and, of course, all the requisite dessert cakes!